Great…another technology to consider, right? That pretty much summed up my first reaction too, and then I gained a significant moment of insight of my own. This new cloud-based discovery enables strategic knowledge acquisition; collaborative wisdom & knowledge-sharing essential for effective critical-thinking at the Moment of Need through next generation curation technology. Being a big fan of Point-of-Work technology, I initially imagined redundancy but that feeling of overlap and a personal flashback of “What could’ve been?” served as motivation to dig a little deeper into why Performance Insights are different from Performance Support. Both of these roles possess Moments of Need, however the resolutions for those Moments tend to be more strategic for the leadership roles than the tactical nature of performance by individual contributors. Even so, there exists a slight overlap of common needs. Another insight that surfaced in my brain dealt with a common denominator role tasked with supporting leaders and individual performers – Learning & Development (L&D). Performance Insights have a role at all levels within the ecosystem. In this post I’ll focus on L&D functions responsible for informing the 7-Right Things at the core of intentional design. Figure 1 above shows a knowledge pyramid and provides a good backdrop for this post. Those challenges sound unflattering to say the least, but true due to operating within a training paradigm. We researched and curated content for the sole purpose of creating a training solution. Training paradigm short-falls aside, the common denominator symptom here is excessive elapsed time. Could it be that our L&D methodology/capability represented at least one major root cause contributing to the excessive time lapse between finding scattered resources and delivering them to relevant Moments of Need critical to informed action? Did we gain insights? Absolutely. Insights are not new, but the process of extracting, managing, optimizing, and delivering them at Moment of Need and within Point-of-Work did not exist within our paradigm limitations. 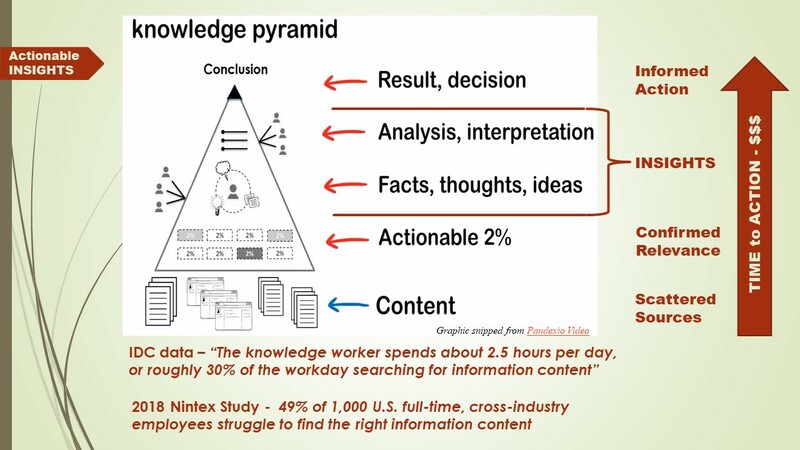 From an article by Daniela Di Noi on 5/22/18 – “Do workers still waste time searching for information?” shares IDC data that reveals “The knowledge worker spends about 2.5 hours per day, or roughly 30% of the workday, searching for information.” I’ve seen this IDC data many times and it typically represents a cross-industry aggregate of all knowledge worker roles. We (L&D) are a critical segment of that aggregate and not exempt from the implication of these data. L&D owns a monster up-front search task to allow research and curation of source content for training…we read and watch videos…we cut & paste…we use SnagIt…we rewrite…we share documents to collaborate with colleagues and/or approvers/SMEs…we glean roughly 2% actionable information after confirming value and relevance…we gain insights…and then we wind up burying them in training content that is nowhere close to assets accessible nor agile enough for application at Moment of Need or at Point-of-Work. If L&D does not step up, who does? Certainly, the effort to search and glean insights will still happen but by whom…and how long will it take…and will it get to the right people? Individual contributors will search and find…so will executive admins for executives…project team members…SMEs…the list goes on. And what happens to those discoveries? They are shared as attached documents with a couple 30-second insights buried in a 10-plus minute read…forwarded with a note “Read this and let’s discuss”…saved to a number of hard-drives…shared drives…SharePoint…and the list goes on…most never to be found again. We can tag a great number of those insights as MIA. There really needs to be a better way…for L&D…and for anyone else who is tasked to deliver insights critical to informed action. Accessibility – the presence of the right access to the assets by the right people (roles) enabling successful searches in a timely manner – which means searchability must be optimized using metadata tags that mirror the folksonomy of the end-user population(s) – and the right technology optimizes access as well as application at the Moment of Need. Relevance – ensures the right assets (source content and associated insights) enable critical-thinking and informed action – minimizing the need to search further – which is consistent with the “Just-for-Me” aspect of intentional design. Effectiveness – content and/or insight selection aligned with the work at hand…and…in the right amount and right format consistent with “Just Enough & Just-in-Time”. Currency – content that is accurate and backed by maintenance protocols, content & insight ownership, and enabled by a collaborative feedback loop. Dynamic – knowledge-sharing enabled architecture and culture of sharing that permits and promotes “life-after-posting” where additional wisdom, thoughts, feedback, and ideas can be added to encourage and sustain collaboration. Any of this ring true in your world? What would happen if those legacy content repositories had a virtual cross-repository “Czar” who enabled consolidated searchable insights on a single platform without disrupting the installed base of content stuff and embedded tech? What I’ve just described is a cloud-based, Performance Insight Engine overlay that, for all intents and purposes, enables Insight Management. Ever experience a “What could have been” moment? That’s the moment when you make a discovery after-the-fact and just shake your head thinking about how much sweeter a task might have been. The story I just shared with you in this post came flashing back to me with a moment of insight almost immediately after I discovered Pandexio’s Smartsnips, a next-generation, critical-thinking, curation engine. I’m not going to spend time hyping my insights or Pandexio’s tech in this blog post; instead, I offer this 180-second (VIDEO) that will do a much better job…in less time…and give you a chance to extract your own insights. You’re welcome. Maybe you will have your own flashback “What could have been” moment based on scenarios faced in the past or have bearing down on you in the near future. It’s your call. Personally, I’m beyond impressed, and though I should share. Also, I’m in the process of building a HyperPoint with related Topics and Insights around the Point-of-Work Discipline that drives my coaching business. I hope to launch by mid-November and offer this opportunity for you to have free access to it. The site will give you an opportunity to see SmartSnips live in captivity and maybe even score a few valuable insights you can use. All it takes is an email addy to become a member…and no…this is not a scam-for-spam deal. As always, thanks for reading, and I welcome thoughts, comments and ideas…or insights…as the craving is flung upon you.